Tara was born Hangzhou County, right between Thousand Island Lake and Yellow Mountain, the origin of Yuye or Jade Leaf and Maofeng or Hairy Eyebrow. She studied in Nanjing, where she met Michael and after 5 years of exploring tea as a couple they got married in 2013. For their marriage a group of 30 foreigners visited not only her home town, but they organized a China tour over the span of three weeks and collected valuable tour guide experiences. Tara works for Cha-Shifu on weekends only, she performs her career focusing on cosmetics for a German company in Hangzhou. 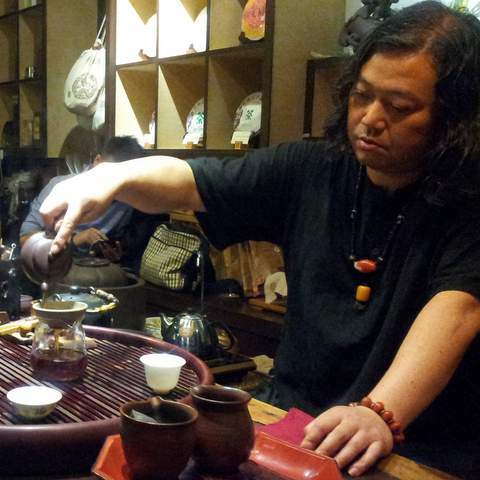 Michael lives since 2008 in China and moved to the tea market of Hangzhou also know as the capital of Chinese tea trade on January 8th 2009. Since 2002 he drinks tea deliberately, experiencing green teas feature of staying alert during hours of studying. In 2010 Michael turned his passion into business and initiated organic tea trade by setting up Teekenner GmbH together with a partner in Munich, Germany. Here he intensively got into tea farming, consulting on organic certification procedure and development of web-based traceability system. By 2014 a vast network of friends in tea & ceramic from East to Southwest of China has grown, at the same time Teekenner GmbH became a mature business, allowing him to reduce his industrial career to some temporary consulting assignments, while focusing on tea culture. In 2014 I won a gold medal during the 4th China International Tea competition and in 2015 I was certified tea competition referee and competition judge. Ms Wang, my earliest tea master, she has the patience to explain taste of green tea and its influences of origin and different cultivar. And we are neighbours since January 2009. Ms Shu, she is the general manager of He Qifang the official distributor of CCNP Zhongshan in Zhejiang province. She is my first stop when its about authenticity of old Pu-erh, especially of eighties and nineties, where she shares her daily practice. Mr Kang manages his mothers Dayi collection, one of the biggest in whole China, located in Guangzhou. He enables us to offer you all Dayi Pu-erh cakes for the official market price and the service to rent a place in Mr Kang's warehouse to store your purchases in most professional way. Mr Lin, I'm deeply touched by his commitment to Pu-erh tea, he travels more than 300 days a year through remote Yunnan tea mountains. Difficult to catch in person, but best source of Maocha news and master of blind tastings for origin sorting. Mr Zhen, head of CNNP Zhongcha Zhejiang, he provides from 1960's Yellow label to 88 Qingbing and Snow cake everything what is real and enables me to offer to official market prices, making the Pu-erh market abroad a bit more transparent. Mr Pan the rock tea hunter, similar mindset as Mr Lin, but luckily his region is much smaller. Therefore he has time for organizing China's celebrities tea club, where he makes Gongfu sessions for Jack Ma or for you, if your are willing to pay. Ms Zhao, Head of China tea standardization and quality grading, we met very only a couple times, first at the recent 4. China Tea competition, where she was the judge of tea quality by soup sorting contest. Cha-Shifu vision is connecting tea drinkers and tea farmers or ceramic masters, through a direct service and e-commerce platform, where professionals are sharing their first hand experience on tea culture and at its origin responsibly sourced selection of premium teas and crafted accessories, to promote successful tea preparation, original taste and tea culture, for sustainable consumption valued by beverage lovers worldwide. Connecting supply to demand requires in this case a mission comprising of care for craftsmen spirit to expand customers trust by delivering remarkable educational content, tea and service resulting ultimately in enabled customers engaging socially by sharing their experiences of Cha-Shifu as brand ambassadors. Winning new customers trust and delight existing ones day-by-day works only by responding to customers needs in each of our thoughts and actions in each answer. Our team and network supports in ultimately committed way in transformation of an educated customer to being a trusted partner for tea knowledge base, premium tea and tool supply and well recognized tea sourcing partner. Answering always to customer desires by thinking and doing. Expanding trust by operating realistic solution to our partners. Living a culture based on open, fair and direct communication.